I was introduced to the skeptic community by Rationally Speaking, a podcast I found while wandering aimlessly on the iTunes Store. I also joined the New York City Skeptics Meetup group, which meets once a month to discuss issues related to science and skepticism. 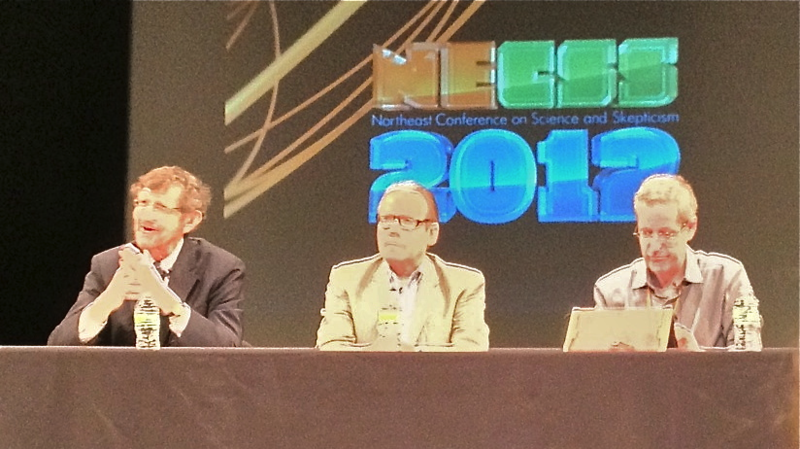 That’s where I learned about the North East Conference on Science and Skepticism (NECSS, pronounced nexus.) 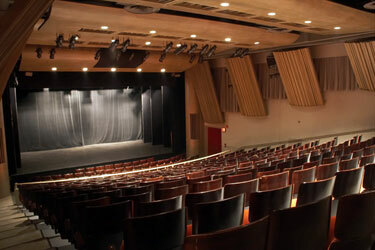 On April 21 and 22, four hundred eager skeptics were packed into the auditorium of the Florence Gould Hall in Midtown Manhattan. The speakers, a veritable who’s who of science and skeptical inquiry, blended passion and humor as they discussed among other things the wonders of science and logical skepticism. Even though his presentation was titled Dance your Ph.D., John Bohannon talked about war statistics for almost half his time. His presentation was interesting and informative, but the title led me to believe that his entire presentation was about videos of people describing their research through dance, which, to be fair, the other half was. PZ Myers, on the other hand, shafted us on Sunday morning by calling his presentation Cephaloporn, and then telling us why he loves biology. Deborah Feldman, author of Unorthodox, all of 25 years, explained how she snuck around to read books during her cloistered Hasidic upbringing, complete with religious-only education, arranged marriage at 17, becoming a mother soon after (seems redundant, Hasidic Jews are hardly known for family planning), and leaving the fold to pursue an independent but undoubtedly intimidating life as a single mother shunned by the people she once called her own. I couldn’t even imagine kids growing up in Brooklyn, NY bereft of English and an egalitarian education. The search for extra-terrestrial intelligence, or SETI, is responsible for some cognitive dissonance. It blows my mind but I always feel there are better uses for that money, and Seth Shostak didn’t affect that position. Ethan Brown, the 12-year old genius, squared and cubed and cube-rooted numbers on stage, proving once more that some minds are phenomenal. At one point, he asked for four random numbers, to form a four-digit number that he would square on the fly. The fourth number called out was a zero. He replied, with a puzzled-expression like, “Could someone be this dumb?” that this would be like squaring a 3-digit number and multiplying by 100. He walked out, just like he walked in, our jaws near the floor during the whole thing. James Randi, the amazing one himself, was on on next. He spoke from the heart, if that expression has ever been true it was that day, about the vitriol he has for psychics, homeopaths and faith-healers who swindle people with anything from pseudoscience to plain trickery. He was followed by the physicist Debbie Berebichez, who appealed to us to encourage more young girls into the hard sciences, or at least, to convince them that they aren’t misfits in calculus class. I agree, although I disagreed when she expressed her disappointment that working women (but not men) who are competent are often less-liked. I’m sure men feel something similar, but it is possible that they have fewer affiliation needs at work. The highlight of the evening was a fundraising reception. For skeptics with means, this was one of the ways to support NECSS. So yours truly decided politely to sit this one out (Why? Please google means and then graduate student). Then our host, Jamy Ian Swiss, called out a seat number randomly for a free pass to the fundraising reception at Connolly’s pub. So there I was, one out of four hundred, with a dose-dumping of a life’s worth of luck and a chance to rub elbows with the luminaries of the weekend. 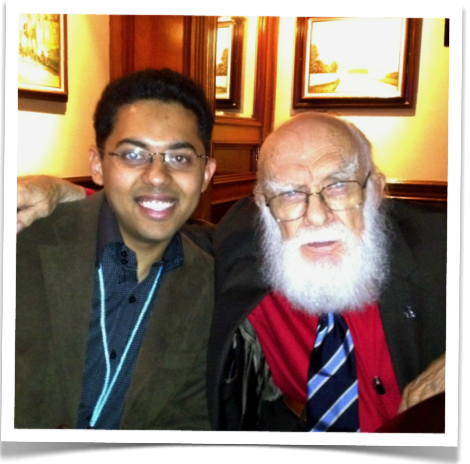 What I learned later was that I also got a tête à tête with James Randi – who’s very approachable and down-to-earth, thank you for asking – over drinks and hors d’oeuvres. What do you know, being randomly selected has positive connotations too. At the reception, Jay Novella of the Skeptics’ Guide to the Universe invited me to watch as they recorded the show live (to be aired on May 6) at the Hilton hotel that night. Thanks Jay! The usual cast, with Seth Shostak and James Randi guest-starring, discussed a bunch of things, culminating in a powwow over whether sloths could swim. Apparently sloths climb down trees to crap at their base. I don’t remember much else, except my bladder being ready to burst. I took the elevator down 43 stories to pee when they took a 5-minute break. On my way back, guess what, the elevator needs a key-card to take you above the 39th floor, so I got some exercise. Well, the more you sweat, the less you want to pee. After the taping, which ended around midnight, I took an F train back to Queens and the real world. Sunday morning, I was back at the venue at 10 am. After PZ Myers’ Cephaloporn, Joe Nickell, probably the only full-time investigator of strange occurrences told us about the case of the two Will Wests, the case that made fingerprinting official in the U.S. Robert Olsen is skeptical of how actually significant that case really is. 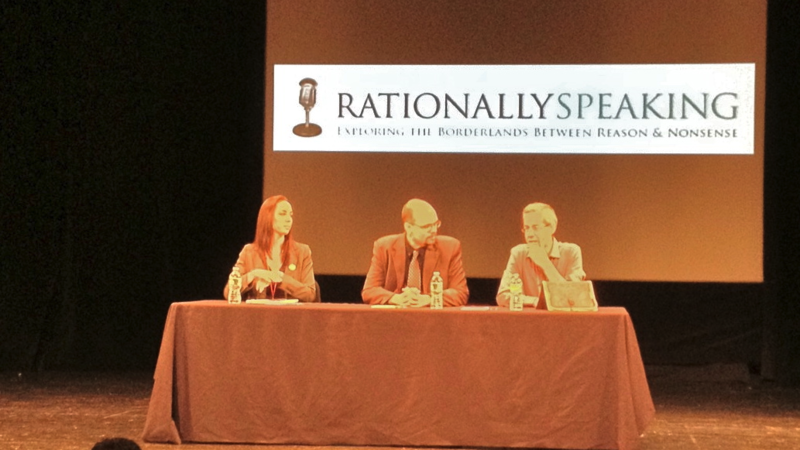 Then I watched a live recording of a special episode of Rationally Speaking in that they spoke about The Simulation Hypothesis and the problem of natural evil, but also that Massimo was out-worded by David Kyle Johnson. George Hrab explained dealing with grief as an atheist. We non-believers vacillate between being tired and offended at being asked, “What do you think of when you’re sad?” or told that we will need god when we lose a loved one. Seriously, only a megalomaniac would foster complex relationships between people and then develop elaborate schemes to separate them, often with pain and suffering as by-products, just so they need his murderous shoulder to cry on. I don’t know how many logical fallacies believers help themselves to, but Hai-Ting Chinn mocked out a quite a few in her operatic solo and then a duet with George Hrab. Probably the most awkward part of the conference was the pre-fist-fight between Massimo Pigliucci and J. Scott Armstrong on futurism and the ability of experts to predict outcomes better than laymen or a tossed coin. Good thing Michael Rogers was in the middle, really. Predicting the future does seem riddled with publication and confirmation biases, if you ask me. We remember successful predictions and successful predictors more often, and it’s possible by sheer probability that some people are right far more often than they are wrong. That doesn’t make them any better than the rest of us. 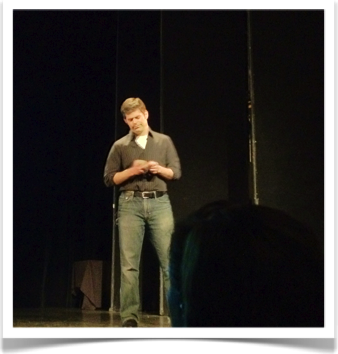 Brian Wecht came on next, and spoke about theoretical physics, bosons, fermions and particle accelerators to name a few topics. He ended his speech by calling string-theory haters d**ks, and I agree. There it was: a great conference, which brought together bright and insightful people to meditate, cogitate and debate questions of morality, spirituality and religion and to agree that people who hate string theory are d**ks. Call me an atheist, a non-believer, a rationalist, a skeptic or really whatever but NECSS was the first place where I realized how not alone I am in this transgression. Attending a geek-fest is fun in itself, but the cherry on top was a shot at meeting some really impressive people, and learning simply how much smarter than me they are. It is actually quite liberating. The weight on one’s shoulders gets considerably lighter knowing there are people far more significant. Skepticism, to me, has always been about not having an allegiance to anything except the truth. In so doing, skepticism sets the mind free, and I don’t ever want to be tethered again, no matter how comfortable, how reassured or secure it makes me, and those who disagree probably hate string theory.